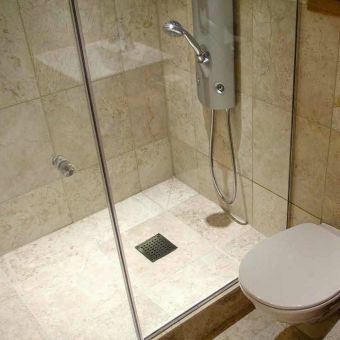 For many, the wet room is the ultimate in showering, we can understand why, as it will allow plenty of room to walk into the shower and in essence it is either part of the bathroom itself, or in many cases it can be a completely dedicated shower room. We have been helping people with wet rooms for many years and we have huge a huge selection of wet room packages at our pages. We stock leading brands at fantastic prices, they come in a wide range of styles, designs and sizes allowing us to provide you with a wet room to suit your needs. We hope that there will be something here which you will find suitable, but as always, we will be only too pleased to help you if you care to contact us. Most of the wet room packages shown include the necessary glass panels, which of course comply fully with all relevant safety regulations, this will enable you to choose the type of shower unit that you prefer. We have also included some complete packages to give an indication of a finished wet room. One example of this is the Matki Straight Wet Room Panel with Deluge Shower Pack and is a stunning designer inspired wet room. This has been described as a thing of beauty, a single sheer panel of safety glass, anchored to the wall by chrome supports, supplied 300mm overhead deluge shower system, handset and high power thermostatic shower valve, just sensational. 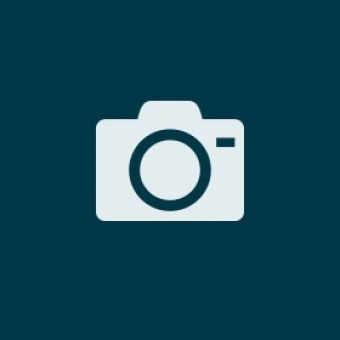 Your bathroom is one of the most important rooms in your house. No longer is it seen as a functional place where you spend as little time as possible, it has grown with the times and has now become to some – a sanctuary. A place to spend time each morning getting ready for the day ahead – often waking yourself up with a refreshing shower. And at the end of the day or getting ready for bed, perhaps having a nice relaxing shower to wind down and soothe the aches and tensions of the day. With advancements in design and technology – lighting, heated towel rails, under floor heating, bathroom suites and accessories, showering units and indeed, wet rooms, are all used to create that place to be. Regardless of what time of day you shower, you want your bathroom to be a place that offers rejuvenation and comfort and to be a place to relax and unwind. A wet room can provide all those things and more. For some years now, having a wet room installed in your bathroom has added that extra wow factor to your home. No longer only available as an added luxury to a hotel room, a wet room can now be installed in almost every bathroom at home. It doesn’t just have to be on the ground floor either: as long as it is installed correctly, you can have a wet room on any floor. 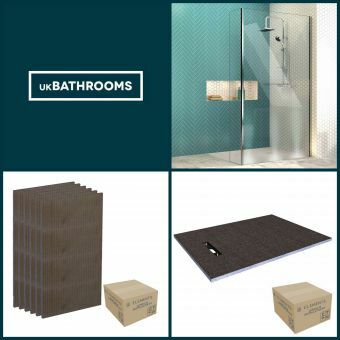 With the wet room packages that we offer here at UKBathrooms, you’ll be able to create the sleek, sophisticated, modern look you want in your home at the right price for you. It’s important that you choose the right wet room solution to suit your tastes, requirements, budget, and, of course, your bathroom. With so many options available on the market, making the right choice could be a daunting task! 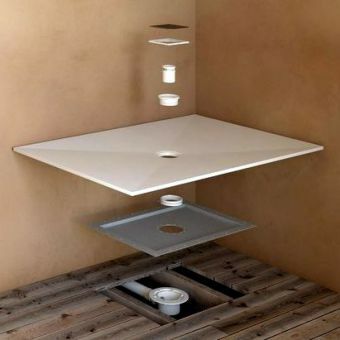 That’s why at UKBathrooms, we’ve narrowed down the search for you. We’ve been helping our customers select the right products for years, and our combination of knowledge and experience gives us the confidence to hand-pick a collection of packages to suit all budgets. However, if you’re not sure what you’re looking for and would like to talk to us about options, don’t hesitate to give us a call. 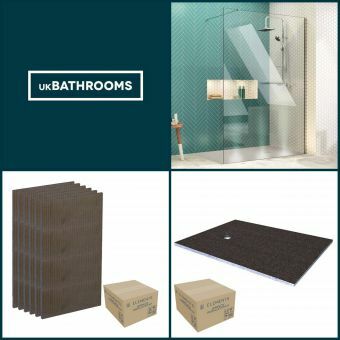 We stock leading brands such as British made Kudos and Matki and using our extensive knowledge of bathrooms, we have put together an exclusive wet room package from sourced materials which are unique to UKBathrooms and known as Rho. Glass panels and shower trays come in a wide range of designs and sizes and all at fantastic prices; in fact, we’re so confident our prices are the lowest, we guarantee you won’t find a cheaper price anywhere else! What are the main features of a wet room? 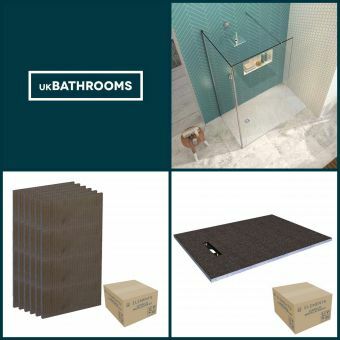 A typical shower consists of a shower tray and screen; some of our wet room packages still have a shower tray option included as seen in our range of Rho packages, but a true wet room removes the need for the traditional shower tray. The floor is made waterproof by a process called tanking and then tiles or waterproof flooring are laid down instead of a tray. 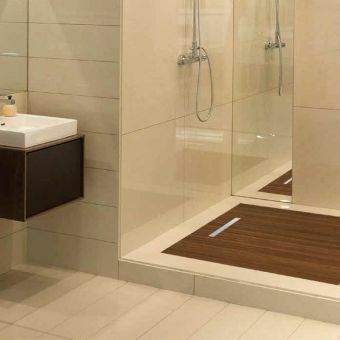 If space is a factor in your bathroom, then a wet room is a must solution, simply removing the shower tray creates that feeling of space even in the smallest of bathrooms. 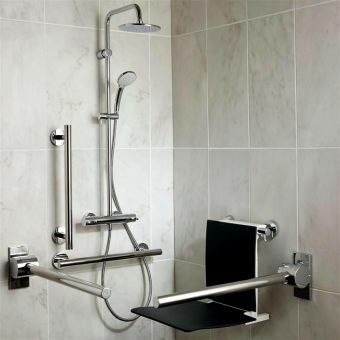 One of the other main features of a wet room is that it can also be the perfect solution for anyone that has impaired mobility who would have problems accessing a typical shower tray installation. 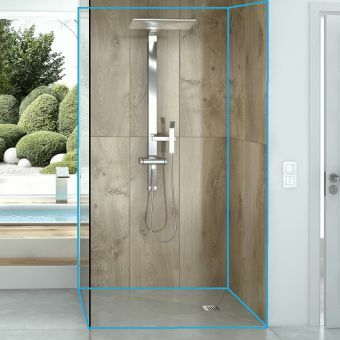 Kudos, Matki and Showerlux all have packages that don’t include the shower tray and with their flexibility in design and installation, they are a perfect solution for that type of scenario. The packages we have available at UK bathrooms can suit any personal requirements and size of bathroom. Please feel free to contact us to discuss your requirements before ordering. A bathroom should feel spacious, light and airy and that’s easy to achieve with a glass panel or shower enclosure. Made from safety glass and often using the most discreet fixtures, you can easily achieve the minimalistic look while adding a touch of elegance to your bathroom. With more options available to customers than ever before, we hope our refined selection means there will be the right one to suit you and your bathroom. Please don’t hesitate to contact us if you have any questions. 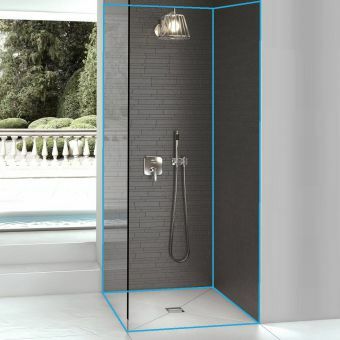 Shower enclosures can be constructed in many different ways: with or without a door, flat panels or curved, walk through or corner fitted - the options available today mean you can design a wet room solution to suit any style and shape of bathroom. 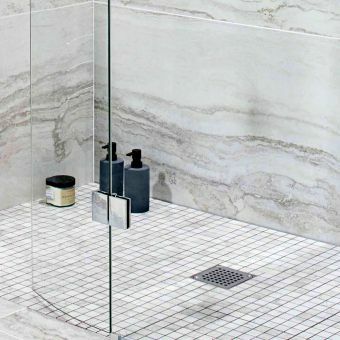 A corner shower enclosure doesn’t have to be curved; flat glass panels are an excellent alternative and shower enclosures can be created against one wall or two. British designers, Matki and Kudos, and Showerlux all offer viable solutions with the versatility and flexibility of their products and in the installation process to create the shower unit of your dreams. Create a stylish corner solution with the Matki flat glass panel, with options to use UV bonded return or a single matching side panel, this package gives flexible installation options and can be used with or without a shower tray. 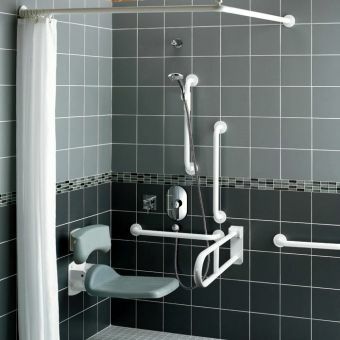 In a one wall scenario, the Kudos Ultimate 2 Walk-in Shower pack is an ideal option. These doorless walk-in glass panels breathe life and light into the bathroom, creating a welcoming and relaxing place to shower. Recessed, walk through and double walk-in are just some of the options available and as these panels come unhanded, they can be installed to give left-hand or right-hand access. Kudos glass panels are covered with a lifetime guarantee. Deflector panels are also available as an additional feature with this package as are his and hers showering units for the ultimate showering experience. 10 sizes of glass panel width are available from 400mm to 1400mm, and to help keep the glass looking brand new – Lifesheild glass protection is applied as standard from the manufacturer reducing the time you need to spend cleaning. Ultimate 2 wet rooms are available in special order finishes too: brushed nickel, bright nickel, brushed gold, polished gold, and matt black. Please contact UKBathrooms to discuss prices and availability. At the top end of our flat glass panel range is Matki with the straight wet room panel and deluge shower pack. 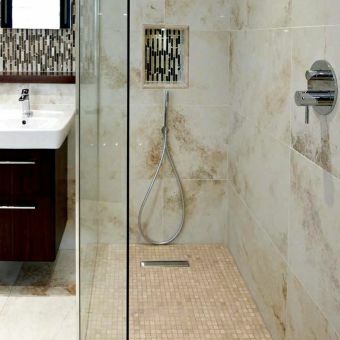 This modern and sophisticated wet room solution offers a touch of luxury to any home. Brilliant and daring, yet elegant and understated, this single sheer panel of safety glass is anchored to the wall with chrome supports. Six sizes of panel width are available ranging from 850mm to 1500mm and can be fitted to a tiled floor or mounted on a shower tray. To help reduce the build-up of limescale and hard water deposits, Matki offer a Glass Guard solution which is a transparent coating applied to the glass. Please request this optional extra when ordering. Matki glass panels are covered by a 10 year guarantee. As we said earlier, UKBathrooms has extensive knowledge of bathrooms and indeed, manufacturers. That’s why we have been able to create Rho as a complete wet room solution that works for you. 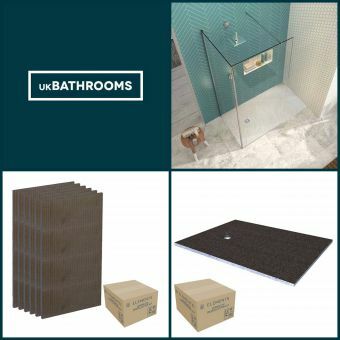 The shower trays throughout this range are low level, 35mm, acrylic capped with rigid steel tubes for extra strength and as part of the wet room packages are available in three different sizes: 1400mm x 800mm, 1700mm x 760mm, and 1200mm x 800mm. 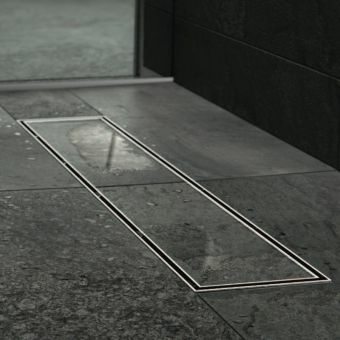 Varying widths of glass panels are available to accompany the shower tray, and they are all manufactured using 8mm safety glass and have an easy clean finish as standard. Rho glass panels have a lifetime guarantee. Ceiling posts are an optional extra for that added security. 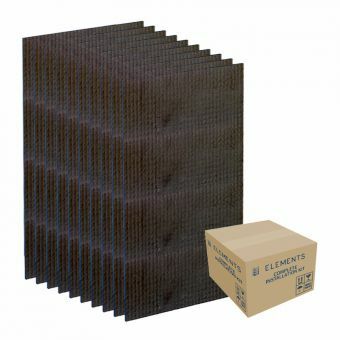 The water removal pipe is central rather than in the corner as shown on pictures and at 90mm in size will remove water from the tray quickly to avoid any build-up. The only curved shower panel in the wet room packages range is from premium manufacturers Matki and choices of left-hand or right-hand opening are available. The beautiful curved panel can be adjusted through the use of the unique concealed glass support and is designed to be positioned directly onto a tiled floor, giving you ease of use and even easier access. Made from 6mm toughened safety glass with adjustable bracing bar this simple, yet sophisticated shower enclosure seems to hang suspended in space. There is ample room to shower in comfort.